Founded in February 1910, the New Jersey Business & Industry Association has served the State’s private-sector employers for more than 100 years through good times and bad. Read the History of the New Jersey Business & Industry Association as published in the September 2010 issue of New Jersey Business magazine. 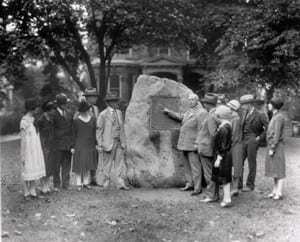 In this 1926 photo, Association President J.P. Bird points to a bronze plaque outside its then-headquarters at 175 West State Street. The plaque contains the names of NJBIA’s executive staff and board.